Sri Lankan refugees have been making the news again in recent days. A group of 40 whose claims of persecution have been rejected by the UK was sent back to Colombo at the beginning of the month. Only hours earlier, more than 100 others had been arrested before they could even leave the island – the boat that was supposed to carry them to Australia was spotted by the Police. Some people are clearly desperate to get away. A few months ago, the BBC reported the story of 200 Sri Lankan refugees stranded in Togo. They had paid agents $6,000 each to be taken to Canada. Instead, they found themselves incarcerated in a football stadium in a country they probably hadn’t ever heard of. They weren’t being given enough to eat and they were suffering from malaria. Who knows how many had died before they even got that far – such journeys generally claim dozens of lives. And now they are being deported. When they reach Sri Lanka, they will be under suspicion. Asking why people would take such a risk doesn’t usually generate much in the way of interest. Many of us just assume that they are all LTTE cadres. That is unlikely to be the case, three years after the end of the war. 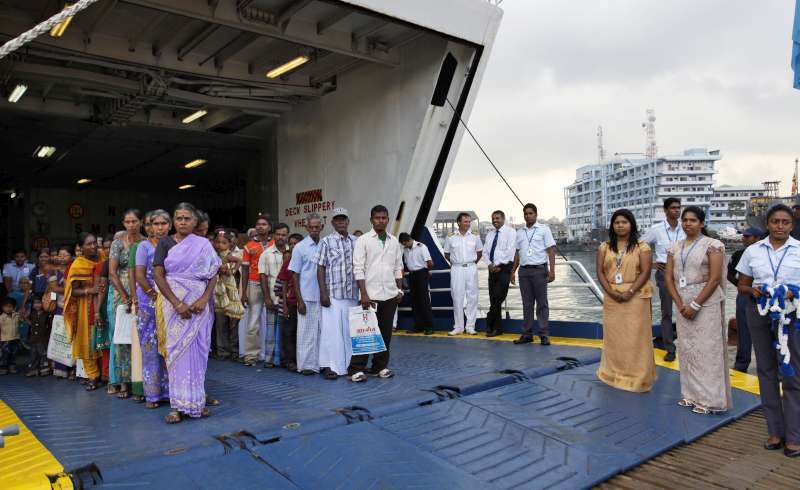 Nevertheless, it is our lack of interest in another group of Sri Lankans that I want to draw attention to in this article – Sri Lankans who have been given refuge overseas yet actually want to return to the island. I refer here to the 70,000 Sri Lankans who have been staying in temporary camps in India for much of the last 30 years. Ironically, these probably constitute the majority of Sri Lankan refugees. According to UNHCR, the refugee claims of just over 140,000 Sri Lankans have been accepted worldwide to date, of which 100,000 by India. In addition to the 70,000 in temporary camps, there are another 30,000 Sri Lankans living with relatives and friends in Tamil Nadu. Given the fervour with which Tamil Nadu politicians talk about the plight of Sri Lankan Tamils inside Sri Lanka, we might expect those who crossed over to India to have been treated like royalty. At least they should have been given their full rights, as the ‘brethren’ Karunanidhi and more recently also Jayalalithaa embrace wholeheartedly in their speeches on Sri Lanka. In fact, they are languishing in an appalling state. There are 112 temporary camps in Tamil Nadu, spread more or less evenly throughout the state. The refugees are given some relief – they get a cash dole of INR 400 per month for a head of family, INR 288 for other adults, INR 180 for the first child and INR 90 for other children. It obviously doesn’t go far. They need to work, but they are only allowed to leave the camps between 6am and 6pm. They have to apply to the official in charge of the district to stay away for longer – a process that is fraught with difficulties. And even when they are successful, it is not easy to find employment. They are not entitled to government jobs, and private sector companies exploit them when they find out about their refugee status – they are paid less or made to work under worse conditions. University graduates often end up working as labourers. Those staying in camps near major urban areas are fortunate. In rural areas, even labouring work isn’t available. Most of the refugees were farmers or fishers in Sri Lanka, but there is little chance of their being able to continue these activities in India. They can’t buy land, and they are generally kept a long way from the sea for security reasons. Even when they manage to make a bit of money, they can’t do much to improve their living conditions. They are stuck in the camps. They can’t even get the permits needed to buy sand to extend the ‘houses’ some of them have been given by the state – 10 foot by 10 foot windowless rooms made of concrete and covered with a metal sheet, too small for all family members to lie down at once and in any case too hot to remain inside for long enough to fall asleep. Some refugees have lived for several decades in abandoned grain stores put up during the British period, hanging sarees for privacy and going to the fields to relieve themselves. They don’t even have a water supply. A handful of NGOs are permitted to work in the camps, but their activities are limited and strictly controlled. Outsiders are not allowed to enter. Even UNHCR can’t visit. Perhaps worst of all is the lack of hope. The refugees don’t see any way in which their lives can be anything other than miserable in India. They have been in the same pathetic situation for 30 years – an entire generation. They are aliens in Tamil Nadu. Many of them want to return home. If they approach the UNHCR office in Chennai, they can get help in arranging their travel, plus a grant of SLR 10,000 per adult and SLR 7,500 per child to establish themselves once they reach Sri Lanka. Some took advantage of this assistance in the immediate aftermath of the war, but the numbers are falling. There were 2,054 returns in 2010, but only 1,728 in 2011. UNHCR figures for the first quarter of this year showed a further decrease – to 408. At this rate, it will take several decades for the 70,000 in temporary camps to return to Sri Lanka. They will be long dead by then. The question of why they aren’t returning isn’t too perplexing. For a start, they are yet to be convinced that the war is over. Some of them have come back to Sri Lanka several times already, only to have to flee again when fighting restarted – on each occasion leaving behind everything they owned. They don’t want to risk another round of displacement. Confidence will grow over time, but this will take much longer in the absence of the political solution they were led to believe they could expect. The long delay in starting talks with the TNA, and the recent decision to refer the matter to a Parliamentary Select Committee, make them think that it will never happen. At the same time, the Government is either unable or unwilling to restore their faith in the Security Forces. The extremely belated decision to inform close relatives about LTTE cadres detained at the end of the war is hardly sufficient to restore transparency, while effectiveness is now apparently a lost cause, with abductions continuing at a disturbing rate. I won’t even start with accountability. The refugees want to see progress on all of these issues. However, they also need more structured support for their return. They are poor. When they fled Sri Lanka, only the poorest went to India – those who could afford it headed straight for the West. And they have become even poorer during their time as refugees. They need more than UNHCR is offering to rebuild their lives after so long away from the country. I believe that they should also be given the choice of staying in India if they prefer, as citizens. Some of them were born and brought up there. Whether they stay or go, some kind of agreement between the two countries is long overdue. However, clearly neither party is keen – the refugees are never even mentioned when Indian ministers or officials visit. Even Tamil Nadu politicians pretend that they don’t exist. As usual, the Government doesn’t appear to have a plan. The only time anybody remembers these Sri Lankans is when they try to emulate their compatriots by risking their lives to get to the West, as a group of 150 did just last week. Then and only then are they in the headlines.